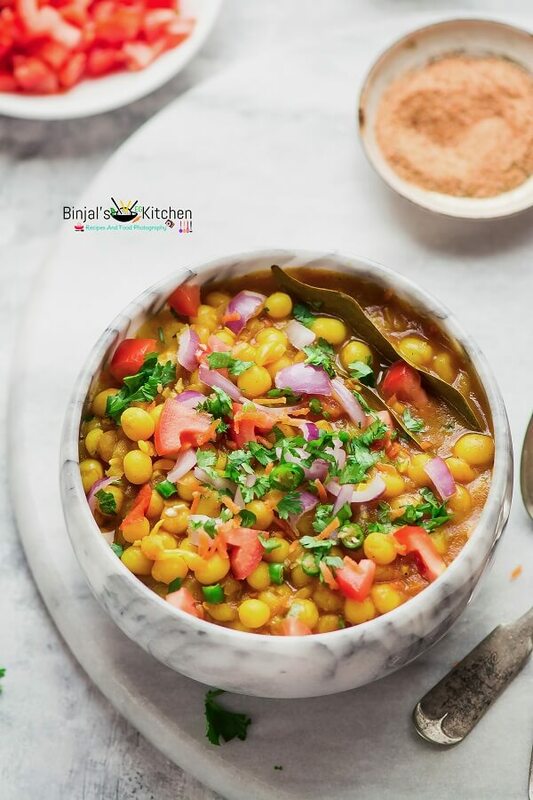 Ghugni or Dried Yellow Peas Curry, serve as a chaat or curry. Ghugni is made from dried yellow peas or dried white peas. Ghugni is a most popular street food in the eastern part of India (Assam, Bengal, Bihar, Odisha). In the traditional eastern Indian style, normally peas are cooked with gravy to make Ghugni. Ghugni is also more common/staple street food in Kolkata, served with puffed rice, some chutneys and chaat masala. 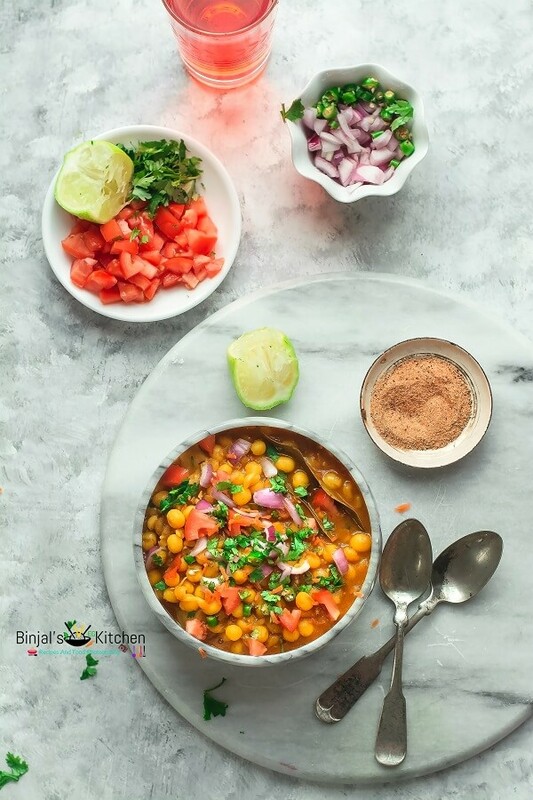 In India Chaat is a savory snack, typically served as an hors d’oeuvre at road-side tracks from stalls or food carts in India, history says it starts in Uttar Pradesh. Chaat has become immensely popular in the rest of South Asia. There are so many types of chaat food items in all over India like Pani Puri, Aloo Tikki Chaat, Sev Puri, Ragada Petties, Dahi Puri, Chole Bhature, Vada Pav…… countless, Ghugni is one of them. 1. Wash and soak yellow peas for 7-8 hrs or overnight. 2. Once soaked perfectly, then add soaked yellow peas into the pressure cooker with required water and salt. Cook the yellow peas on medium fame till 2-3 whistle. Switch off the flame and keep aside to cool down the cooker. 3. Take a potato, remove the skin and chop it into small pieces. 4. Now heat 2 tbsp oil in a kadhai/deep pan. Add chopped potatoes, sprinkle some salt and fry it till all sides become golden brown and cooked. 5. Remove the potatoes using a slotted spoon and keep aside. 6. In the same pan, add 1 tbsp oil. Once the oil gets hot enough, add cumin seeds, bay leaf and chopped onion and sauté it tills soft and golden brown. 7. Now add ginger garlic paste and stir it. Add chopped tomatoes, turmeric, red chili powder, cumin powder, coriander powder and salt. Stir it again till the mixture becomes soft and starts leaving some oil. 8. Add cooked yellow peas, fried potatoes and ½ cup of water, mix it properly and cook it till it starts boiling. Now add garam masala, mix it and cook it again for 2-3 mins. 9. Ghugni is ready now. Serve hot in a serving bowl, garnish it with chopped onion, tomatoes, green chilies and chopped coriander leaves. Sprinkle some chaat masala, black salt and enjoy it. 10. You can also top up with some tamarind and green chutney to make street food style Ghugni. • You can use dried green peas instead of yellow peas. • If you don’t have a pressure cooker to cook peas, you can use a normal deep pot with a covering lead. But, it takes more time to cook peas than pressure cooker. • Adding chutneys or any garnishing ingredients are as per your choices. Wash and soak yellow peas for 7-8 hrs or overnight. Once soaked perfectly, then add soaked yellow peas into the pressure cooker with required water and salt. Cook the yellow peas on medium fame till 2-3 whistle. Switch off the flame and keep aside to cool down the cooker. Take a potato, remove the skin and chop it into small pieces. Now heat 2 tbsp oil in a kadhai/deep pan. Add chopped potatoes, sprinkle some salt and fry it till all sides become golden brown and cooked. Remove the potatoes using a slotted spoon and keep aside. In the same pan, add 1 tbsp oil. Once the oil gets hot enough, add cumin seeds, bay leaf and chopped onion and sauté it tills soft and golden brown. Now add ginger garlic paste and stir it. Add chopped tomatoes, turmeric, red chili powder, cumin powder, coriander powder and salt. Stir it again till the mixture becomes soft and starts leaving some oil. Add cooked yellow peas, fried potatoes and ½ cup of water, mix it properly and cook it till it starts boiling. Now add garam masala, mix it and cook it again for 2-3 mins. Ghugni is ready now. 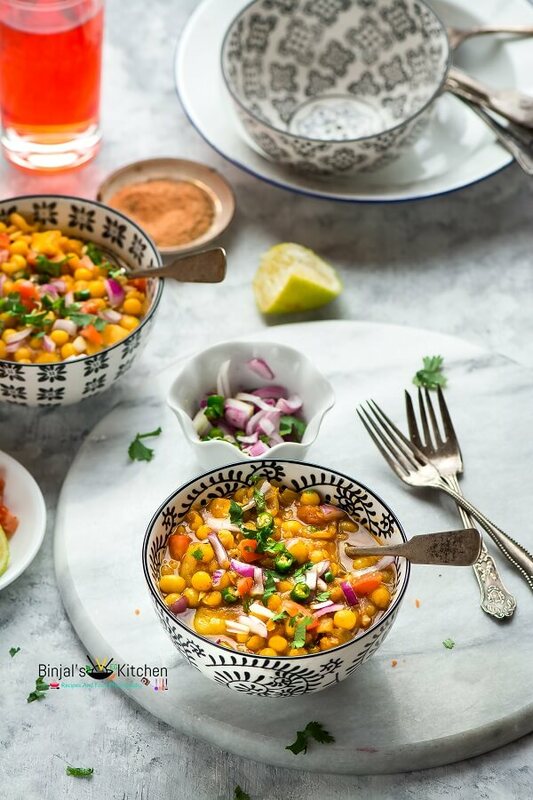 Serve hot in a serving bowl, garnish it with chopped onion, tomatoes, green chilies and chopped coriander leaves. Sprinkle some chaat masala, black salt and enjoy it. You can also top up with some tamarind and green chutney to make street food style Ghugni.